Week 67 This week we get some more brass etchings, including the first of the hand rails. I didn't do very much this week. I'm not going to fit the railings yet. 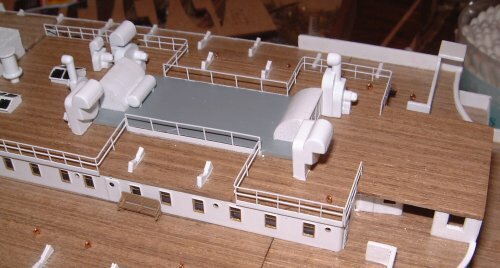 The black of the hull is going to need re-painting, and this means that I'm going to have to mask the superstructure. The railings look very fragile, so I'm not going to risk damaging them when I mask up the model. I'll re-visit this page when I do fit them. I have fitted the four panels. These were Super glued in place. I did need the flatten the bulwark where they are fitted. There was a bit of a curve and they didn't sit very well. The windlass tops were fitted with a touch of Super Glue. I roughened the paint with a bit of fine wet'n'dry to give the glue a better surface to key to. You can see I've also started fitting the anchor chains - more of those later. Part 204 & 205 will be made when I need them - far too small and easy to lose. Now I'm actually at week 80 and ready to do the hand rails. The first ones are these. Read forward to Week 83 Hot Tip of the Week for tips on how to prepare the railings. 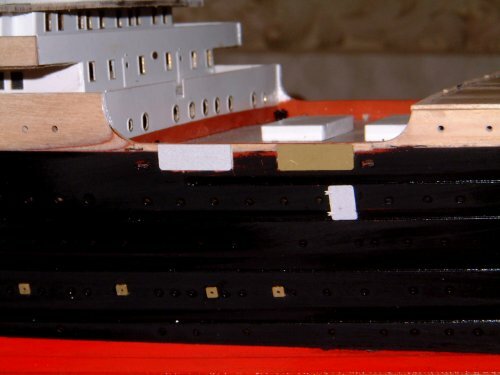 Prepare the model by scraping off any paint or varnish from the edges of the deck, and also scrape off the paint from the bit of etching that will be glued to the model. The sequence of doing the railings can be quite important to get a good finish. 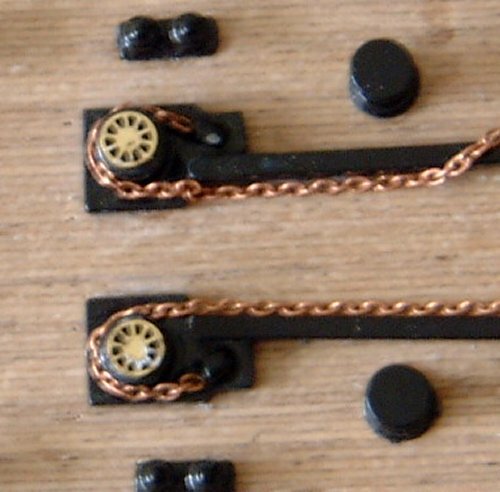 There are no hard or fast rules for this, but generally do the rails that cannot be adjusted first, and leave the rails that can be moved or trimmed slightly last. My sequence for these are as follows. Do the foremost rail firth. This is nice and easy. Next do the two rails that need to be bent. Bend the rails over a hard sharp edge to get a clean bend, then glue the long edge onto the edge of the deck. But them up against the forward rail/aft end of the deck, and don't bother trying to glue the bent part. Now take the rail that goes against the grey deck and try it in place. You may need to bend the athwartships rails (the rails that go sideways across the ship, not along it) out of the way a little. 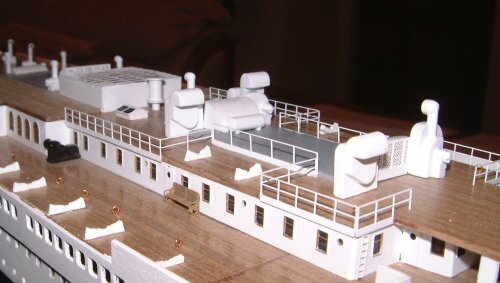 Glue this in place, then move the athwartships rails so that all the ends met. Finally put a drop of super glue on a pin and run it down all the joins where the ends of the rails meet. Repeat this for the other side, making sure that the rails line up across the ship. Just look across the ship and make sure the rails are in line. Here's another view of the completed handrails. They are actually easier that they look. Try and plan ahead - you can save yourself quite a lot of work (or repairs) with careful planning.